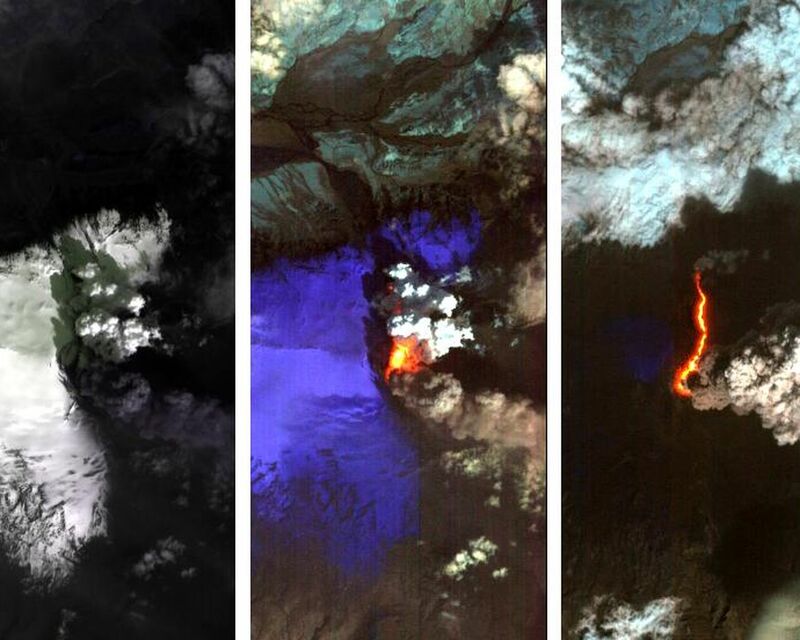 Dramatic changes have been observed at the Eyjafjallajökull volcano in Iceland by NASA's Earth Observing 1 (EO-1) spacecraft. 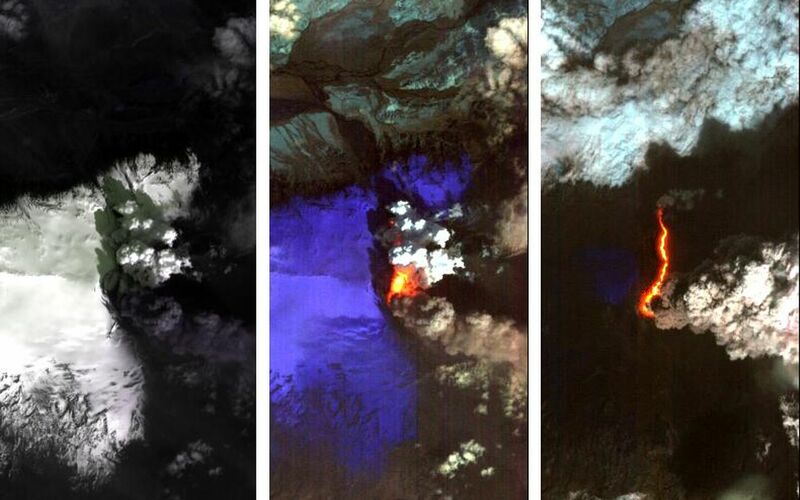 On May 2, 2010, the Hyperion hyperspectral imager on EO-1 imaged Eyjafjallajökull and identified the extent of a lava flow extending northwards from the main eruption vent. This lava flow had been previously reported by volcanologists in Iceland, and is slowly carving its way north through the ice cap. The image on the left (Figure 1) is at visible wavelengths, and shows the persistent dark volcanic plume emanating from the main vent. This plume is still rich in ash, hence its brown coloration. This ash is still causing problems, threatening new airspace closures over parts of Europe. Large cracks at the edge of the crater are an indication of the extent of ice removal from the icecap during the eruption. To the north of this vent is another plume that is very white. This second plume is the result of ice being boiled off, generally non-explosively, by the heat from the silicate lava flow. As a result this plume is probably comprised mostly of water vapour. The black lava shows up clearly against the ice in the left-hand image. The image in the center (Figure 2) is a false-color image in the short-wavelength infrared. In this image, ice appears as blue and hot pixels appear as red. Very hot pixels appear as yellow and white. Red pixels, visible though the plume chart the extent of the lava flow, which has extended some 1.8 kilometers (1.1 miles) northwards from the area of the vent that is emitting the most energy. Total heat loss on May 2 was estimated to be at least 300 megawatts. The image on the right (Figure 3) shows the lava flow on May 4, 2010. The entire lava channel is now exposed, most of the overlying ice having been removed and the white plume has mostly disappeared. Without the plume obscuring heat loss from the lava flow, a better estimate of heat loss can be made. On May 4, the volcano was emitting at least 1,600 megawatts of energy. Each image covers an area measuring 7.7 kilometers (4.8 miles) wide, and has a resolution of 30 meters (98 feet) per pixel. The vertical direction is north-northeast. The EO-1 spacecraft is managed by NASA's Goddard Space Flight Center, Greenbelt, Md. 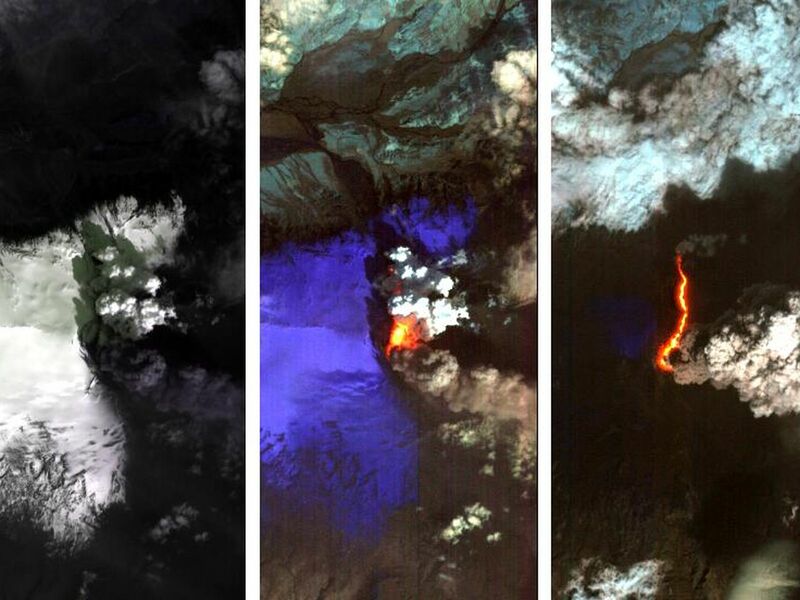 EO-1 is the satellite remote-sensing asset used by the Volcano Sensor Web developed by NASA's Jet Propulsion Laboratory, Pasadena, Calif., which is being used to monitor this, and other, volcanic eruptions around the world.